This will be Part 1 about what direction HART, our local transit agency, may be going. A HART Board Strategic Planning Workshop was held last Monday, June 9. The Eye was there. 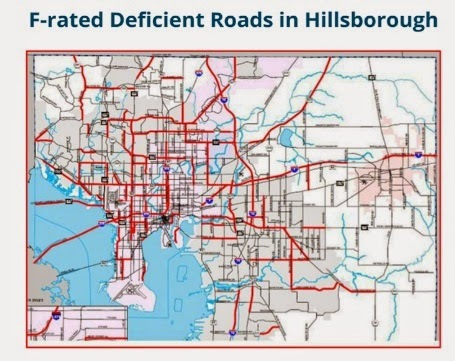 The purpose of the workshop was to discuss the strategic direction of HART and to get an update from the County Administrator on the Hillsborough County Transportation and Economic Development Policy Leadership Group. The update from the County Administrator will be covered in a subsequent post. HART spends about $66 million a year to currently run the bus service. You will find their 10 year Transportation Development Plan (TDP) here. The TDP is required to be updated each year. HART's ridership increased between 2010 and 2012 but the increase appears to now be flatlining. Why? We don't know. Perhaps with the uptick in our local economy, with our unemployment rate down and more people are working, they can afford a car and are driving. HART currently receives approximately $30 million a year in county property taxes, which have been inching up since the housing bubble burst. About 20% of the revenue comes from their fare box recovery and the rest from federal transit formula funds and state/federal grants. As HART's TDP reflects, their Status Quo plan does increase service hours and is currently funded. There will be a need for some increased funding in a few years, even with the Status Quo plan, as buses will need replacing. HART's Vision Plan, which is not currently funded, was discussed at this meeting. This plan includes building out additional cost-effective Metro Rapid Bus Rapid Transit (BRT) services, increasing some express services and local circulators. The Vision Plan has been vetted and approved by HART if funding was available. It would require $400 million in capital to implement and $110-150 million a year to operate. The Vision Plan would double HART's existing bus service in the county and about double the operating costs. It was noted that the much more costly Greenlight Pinellas plan will only improve bus service by 65% in Pinellas. The Vision plan could probably be locally funded with a short term tax increase without using federal dollars that have strings attached and increase the cost. As we previously posted, the Highway Trust Fund is bankrupt and we're almost $18 Trillion in debt. Interim HART CEO Katherine Eagan said HART has saturated their current market and HART should move into new markets of potential riders, address different parts of the county that have different needs and be more customer focused. So how do they do that? With the big, bold Super Sized plan that goes beyond the Vision Plan to target new markets of "choice" riders. Where did this Super Sized plan come from? What I gleaned from the HART board discussion was Eagan was working on some of this with County Administrator Mike Merrill and Board Member Dr. Polzin. Dr. Polzin, for transparency, stated he was working with the County on behalf of CUTR (Center for Urban Transportation Research at USF) where Dr. Polzin works. The Super Sized plan had never been brought before the entire HART board before. This was the first time all the board members heard about it. This plan that has not been vetted by HART would require capital costs of at least a Billion dollars and will cost approximately $330 million a year to operate. It appears this plan would implement the gold standard BRT in dedicated lanes which cost at least $20-25 million a mile which would create a permanent transit corridor. It was unclear if these bus lanes would be managed bus toll lanes, added as additional capacity and shared with users who choose to pay a toll, or strictly dedicated bus lanes. Due to this plan's large capital cost, it would require large amounts of federal funds to implement. While the Transportation Policy Leadership Group has not agreed on a plan yet, County Administrator Mike Merrill stated at the last Transportation Policy Leadership Group meeting in May, that we need to reach out to a new population of riders and entice them in various ways. He said that we need an integrated system that ties a new Bus Rapid Transit System to a new managed bus system and to rail, and that we're going to need a lot of federal dollars. Merrill's comments sounded much like the new Super Sized plan discussed at this HART board workshop. Several board members asked that HART staff provide a comparison or menu of each of these plans, the Status Quo, Vision plan and Super Sized plan that includes cost estimates for each. I was glad to hear it stated that the cost component part must be included as part of the community outreach to help determine what taxpayers are actually willing to pay for. What is the cost benefit of these various plans? There was much discussion about the plans but both Commissioner Sharpe and Murman stated they wanted to "go big and bold" with the Super Sized plan. Let's step back and ask where is the actual transportation funding crisis? It's with our roads. The county has been neglecting our roads for years which has created this mess of F-rated roads. Next year there is only between $5-9 million for roads. Our local gas tax only fills our pot holes. The real transportation funding crisis is we have no money to maintain and improve our roads and this crisis must be addressed. The Transportation Leadership Policy group is also looking at road improvements as even buses need our roads. Before we consider a Super Sized transit plan, let's see the big bold plan for roads since 98% of us use them everyday. And no "enticement" is needed. "The real transportation funding crisis is we have no money to maintain and improve our roads and this crisis must be addressed." This is not correct at all. We have the money. We CHOOSE to spend it elsewhere. The real transportation funding crisis is that our leaders have placed funding needed road work at the absolute lowest priority. There is money, and when we decide how to spend it, roads come in a distant and dead last .0015 of the total budget. And the BOCC continues to constrain roads - ignoring state laws which requires each jurisdiction to address failed roads. It is not a lack of money we suffer from. Rather, it is a conscious decision of our elected leaders to ignore roads in favor of everything else they spend money on - everything. How long will we lie down and accept it?